There’s a scene in the 1999 blockbuster The Matrix that kept jumping into my mind during the annual international cycling conference Velo-City Global held in Adelaide in May. In a flash restaurant, one of Neo’s (Keanu Reeves’) collaborators is making a deal with the enemy, the machines. He bites into a piece of steak admitting that while he knows it is merely a virtual construction that makes it seem juicy and delicious, he would preferred to enjoy the meal and forget about the complex reality around him. In exchange for betraying Neo he will be given a virtual life full of everything he has ever wanted. His memory will be erased so he will never be aware of the awful truth that has befallen the planet: that humans have been enslaved and now exist as passive batteries, their lives played out in a virtual space, the matrix. So, imagine the juicy steak is an endless trail of lovely smooth, green bike lanes. Hey, let’s make that kilometres of segregated bike lanes! Would that be enough for you? Or, would you prefer to head down the rabbit hole and tackle the economic, political and cultural processes that have shaped cycling habits around the world for over 100 years? Did Velo-City Global 2014 get inside the matrix? Passion and inspiration were on show at VeloCity Global – in spades. It was great to be a part of it. 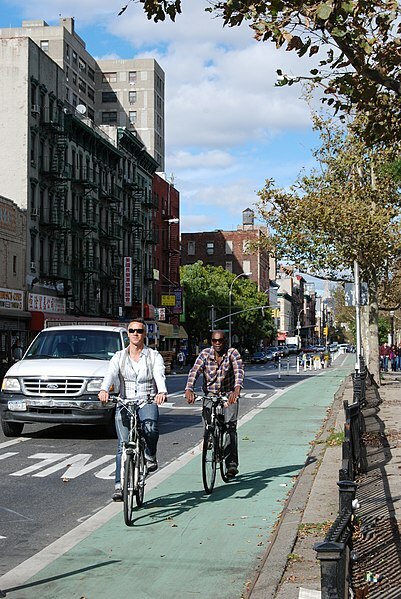 We heard from committed politicians, planners and inspirational cycling advocates. Rock star bicycle gurus, like Dane Mikael Colville-Andersen, leapt onto the stage to blasting Norwegian pop music. Why? Who knows, but it was fun. Quoting a line from the hit movie starring Tom Cruise, Risky Business, he suggested that politicians and planners should just get on with building cycling infrastructure: they just have to say “let’s do this — what the f*ck”. The audience roared. We loved it. So true. And anyone from Copenhagen must know about bike infrastructure, right? We loved Mikael and we loved the quirky tweets he made during the conference. There were great tales of urban renewal and reinvention. Former New York Commissioner of Transportation, Janette Sadik-Khan, gave a vivid and entertaining account of how she helped create over 500km of bike lanes in the urban jungle that is New York City. Her articulate, snappy style somewhat masking the years of hard graft (and no doubt some fast-talking) required to make this change happen. Yet, for me, as the giddy euphoria of being among a group of fellow travellers began to fade, I was left with a nagging sense that perhaps some of the deeper forces at play in the world had been ignored or simply overlooked. With all the talk of planning, wresting space from motorists, bike helmets (to wear or not to wear), segregated or non-segregated bikeways etc, a distinctly rationalist logic fell across the conference. We talked about finding immediate solutions to urban transport issues, building infrastructure, managing the way we ride in a car dependent world. Occasionally we spoke vaguely and hopefully about cultural change. But, to be frank, planners and cycling advocates might not be the best placed to think deeply about such processes. They have more immediate and pressing concerns, like building bike paths and pedestrian zones, budget constraints, planning laws, traffic congestion and working out how to deal with local councils and shopkeepers. Don’t get me wrong. The conference raised a surfeit of practical and achievable plans. But, for me, the conference was hampered by a lack of interdisciplinary thinking that would help us understand how our urban and suburban communities came to be this way. A broader scope might also allow us to see how the status quo is maintained and how we might formulate better alternatives. Presently we tinker at the edges, building beaut bikeways while Rome burns. Yet, the conference wasn’t all logical positivism. Steven Fleming provided a welcome poke to the ribs by reminded us that driving is not intuitive and that the world is not ‘natural’; it is ‘made’ by us and can therefore be ‘remade’ in a way that animates our bodies and our minds. Phd candidate Rafael Upcroft also mashed disciplines by showing the inexorable links between movement, physiology and psychology. And only in the last session did we hear Florian Lennert from the Berlin-based Intelligent City Forum tantalise us with talk of understanding the ‘petro-chemical/auto-industrial complex’ that has transformed our cities, nay, the planet, by entrenching a carbon based economy centered on the production of billions of internal combustion engines. Beautiful paths will undoubtedly draw walkers and cyclists to them. But the low numbers of people using their own energy to move is not only the result of a lack of infrastructure. The central failing of Velocity Global is that in its current form it will struggle to unpick the cloak of progress and modernity that has brought Western society (and increasingly the developing world) to an environmental tipping point. ‘Progress’ for a modernising society in the 20th century meant reinforcing the distinction between mind and body. Our flawed and weak bodies would be saved by modern technological intervention. Modernity asked us to suspend our bodies, making them almost inert while technology and science could move them around and keep them alive if they failed us. After nearly a century, we have run aground. Passivity is on the rise globally and the car remains the most potent status symbol on the planet. On this point, we heard fascinating and alarming tales about the challenges facing cycling in Nigeria, Namibia, China and India, and the insatiable desire for car ownership. Yet, this version of modernity, so palpably embraced by the world, rests on a fundamental denial of what it is to be human: that is, to move under our own power and to experience and apprehend the world through that movement. Modernity, we might say, has rejected the embodied, physical life. When I met people at the conference many were surprised (in a nice way) that a museum curator would be there at all. It is a good point. What part might museums play in this scenario? Museums, of course, specialise in bringing people into relationship with the material world, past and present. Objects have the power to connect us to the lived experience of others, to collapse time and space. They invite us to glimpse others’ dreams and ambitions. They allow us to see the shape and character of their worlds. Through objects, we can better understand the materiality of our own lives, how our bodies have evolved and how they continue to be shaped by the environment around us. A display about the childhood experience of cycling, for example, might allow us to reflect on how we so often lose connection with the joyous physicality that characterised our youth. It might also allow us to imagine ways to reignite that joy. We might rediscover the embodied life. It is time for Velo City Global to broaden its base, embrace an interdisciplinary approach, and step forthrightly into the heart of the debate that must capture the world’s attention. Without that, we will just be asking for more perfectly cooked steak.